Dassault Aviation, France Chairman and Reliance Group Chairman Anil Ambani on Friday laid the foundation stone for the Rs 6,500 crore-Dassault Reliance Aerospace Limited (DRAL) manufacturing facility here.The ceremony was witnessed by French Minister of Armed Forces Florence Parly, Union Minister for Shipping Nitin Gadkari, and Maharashtra Chief Minister Devendra Fadnavis, France's Ambassador to India Alexandre Ziegler, and Kokilaben Ambani, Tina Anil Ambani and Anmol Anil Ambani.The DRAL facility, named Dhirubhai Ambani Aerospace Park (DAAP), is located in the Mihan SEZ adjoining Nagpur's Dr Babasaheb Ambedkar International Airport.The joint venture also represents the largest single Foreign Direct Investment (FDI) by Dassault Aviation of over 100 million Euros in one location in India.Under the JV company, DRAL (51% Reliance Aerostructure and 49% Dassault Aviation), the facility will manufacture several components of the offset obligation connected to the purchase of 36 Rafale fighters jets from France, signed between the governments of India and France in September 2016. Initially, DRAL will manufacture components for the Legacy Falcon 2000 Series of civil jets manufactured by Dassault Aviation and thus will become part of its global supply chain.These first steps are expected to achieve in the coming years, the possible setting up of final assembly of Rafale and Falcon aircraft.The DRAL facility will train thousands of skilled workers in aviation assembly and integration, and lead to huge employment generation in Nagpur and its surrounding areas.It will also attract and house an organic ecosystem of over 200 MSMEs to secure the component and avionics manufacturing needs of Rafale and Falcon jets.Dassault Aviation Chairman, Trappier, declared that "this Foundation Stone laying demonstrates Dassault's firm commitment to implementing Prime Minister Narendra Modi's 'Make in India' programme. It gives the 65 year-long strong association of Dassault Aviation in India a new momentum and the will of future manufacturing developments. 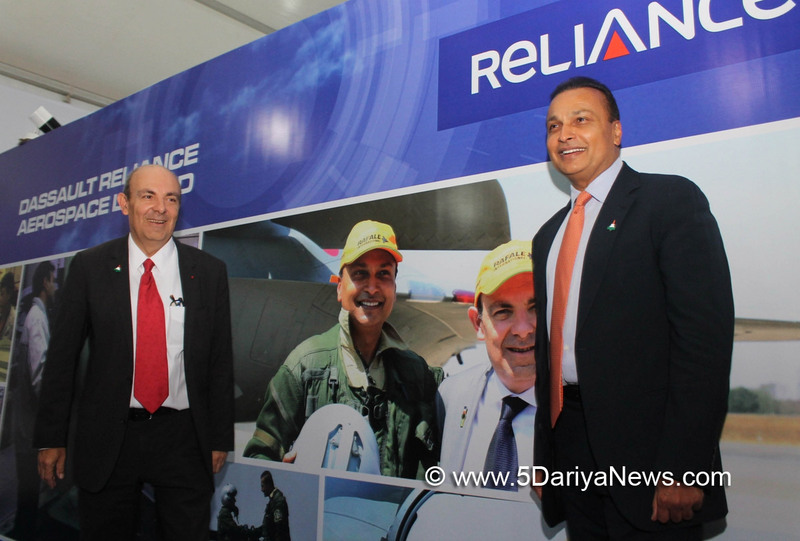 "Reliance Group Chairman, Anil D. Ambani, stated that "this facility in MIHAN Nagpur within the Aerospace Park named after my late father Dhirubhai Ambani could not have happened without the strong and consistent support of Gadkari and Fadnavis".The Reliance Dassault partnership will bring high levels of Technology Transfer to make India a major supplier in the global aviation supply chain, he added. "It will be the endeavour of both Dassault and Reliance to fully support Prime Minister Modi's 'Make in India' and 'Skill India' policies and to accelerate India's pursuit of self sufficiency in the aerospace sector," Ambani assured.